So, after a number of lack-lustre auctions, it finally looks like Bonhams has a genuine challenger to their Entertainment Memorabilia sales. PropStore.com have been selling high-end props and costumes for sometime now, including the occasional Doctor Who piece. 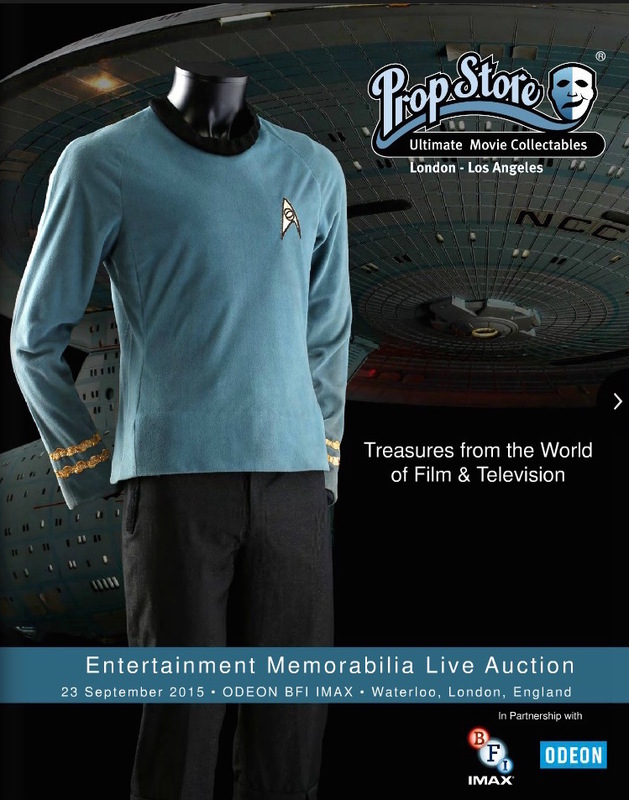 But this month they are holding a live auction at the BFI IMAX cinema in Waterloo - for all intents and purposes a Bonhams style auction. 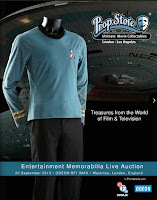 there‘s some amazing stuff on offer, from Mr Spock’s costume from classic Star Trek, to costumes from Back To The Future, the Alien and Star Wars films. And unlike the last couple of years of Bonhams auctions, there are is a good spread of quality items on offer to attract the interest of the dedicated Doctor Who fans out there. 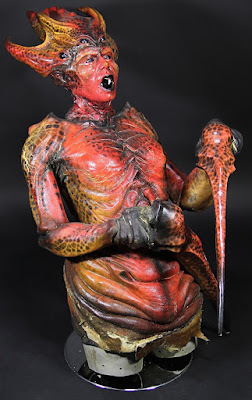 An Empress of the Racnoss (Sarah Parish) bust from the BBC sci-fi television series Doctor Who. Combining production-used components from the episode “The Runaway Bride” and custom made face appliance, the bust was later used as part of the Doctor Who Experience exhibition. The torso and arms are constructed from thick foam with a latex skin that is fastened at the rear with hook and eye clasps. The claws, which were fixed in place for use in the exhibition, are made of fibreglass. The custom made facial appliances are made of foam latex, with the entire assembly supported by a fibreglass body form. The various components are finished in an insect-like red and black paint scheme with the facial appliances painted to replicate the finish of the production pieces. 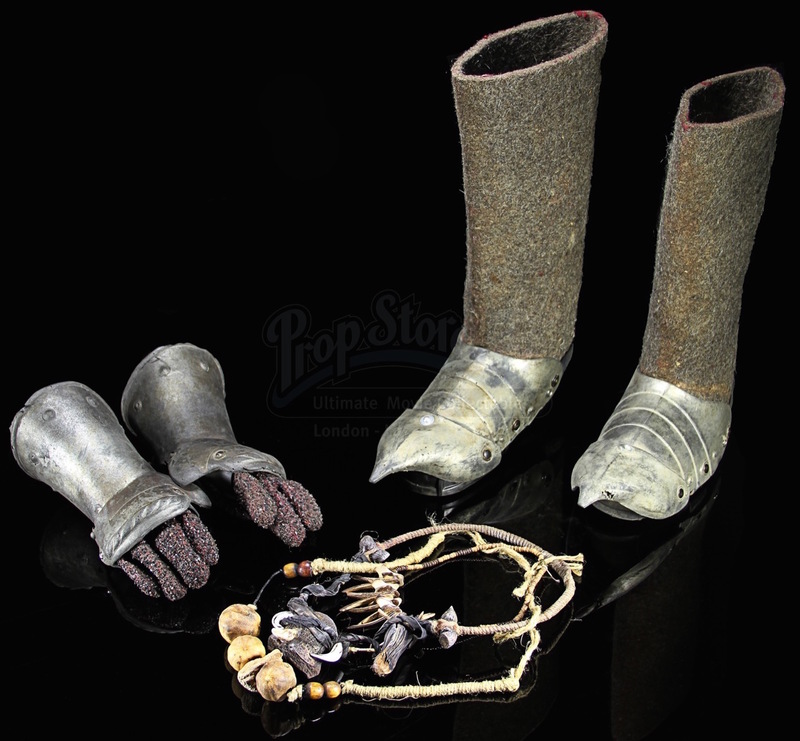 The set features a pair of felt boots, a pair of leather gloves and a collection of beaded decoration with prop bones attached. Both the boots and gloves feature rubber armour plate detailing with straps securing the armour in place. The pieces display minor wear from use including marks to the paint finish on the bone fragments. They remain in good condition. The costume features an overcoat made of red crushed velvet, a pair of encrusted leather gauntlets with fitted rubber armour plates, a brown leather belt and a pair of boots with rubber armour plates and leather strapping. Beaded sashes with prop bones attached complete the look of the creature. The boots are marked “S. Mulhollome” internally. Displaying minor wear from use including tears in the coat and the rubber on the right glove, the costume remains in very good condition. A partial Sycorax costume from the BBC sci-fi television series Doctor Who. This costume was used for the episode “The Christmas Invasion” in which the aliens attempted to take over Earth on Christmas Day. The costume is comprised of an overcoat made of red crushed velvet, a pair of encrusted leather gauntlets with fitted rubber armour plates, a brown leather belt and a pair of felt boots with rubber armour plates and velcro strapping. Beaded sashes with prop bones attached complete the look of the creature. Displaying some minor wear from use including tears in the costume remains in very good condition. 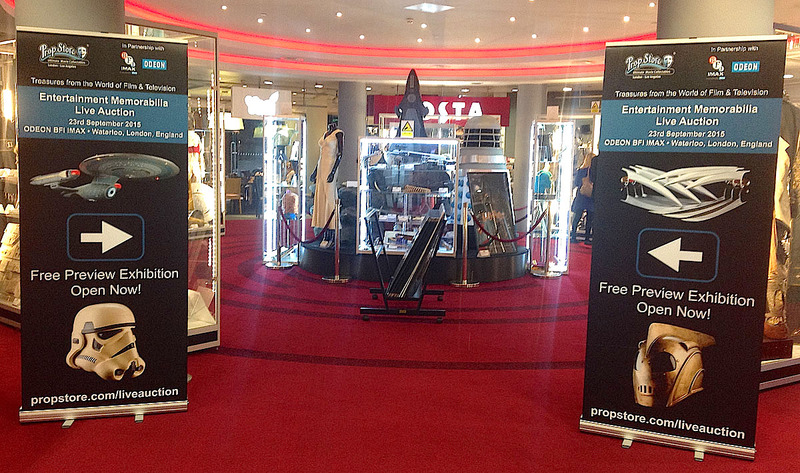 A Cyberman costume display created for the Doctor Who Experience exhibition. This iteration of the Cyberman was used from the show’s second season until their replacement in sixth season. 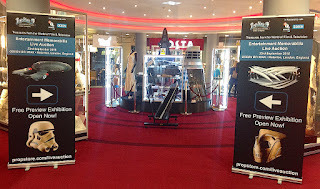 Created by Millennium FX, the creators of the show’s original Cybermen, this costume display features components pulled from the costume’s original moulds and suspended around a metal armature and expanding foam frame. The armour is made from fibreglass with a cold-cast aluminium finish that is polished to a metallic sheen. A foam rubber body suit replicating the appearance of tubing is worn underneath. A removable panel on the back reveals a motor which, when powered via a U.K. mains power supply, causes the torso to twist anti-clockwise several degrees to replicate the movement of the show’s monsters. Blue LEDs powered by a 12v battery are installed in the Cyberman’s mouth. Standing on a MDF stand, the costume has been distressed with scratches to replicate production wear and exhibits evidence of running repairs from its time in use at the exhibition. The piece remains overall in very good condition. As this item contains electronic components, every effort has been made to describe them accurately; however no guarantee or warranty is made as to functionality, lifespan or safety of those components. It is entirely incumbent on the new owner to satisfy themselves as to their safe use and maintenance. 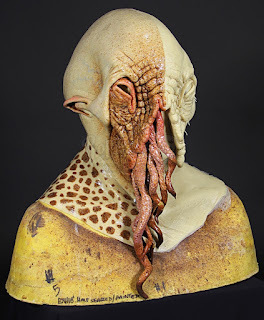 A paint test bust created for the Doctor Who Experience exhibition. Created by Millennium FX, the special effects company responsible for creating the Ood, this bust was made to illustrate the raw, unfinished Ood head and the final finished creature.